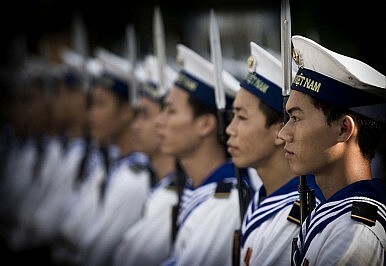 With an eye on China’s alleged claims to the South China Sea, Vietnam is significantly boosting defence spending. Southeast Asian nations may be struggling to get their act together over how to present a united front in response to China’s territorial claims, but this isn’t stopping some of them preparing for potential military eventualities. Jane’s Information Group has compiled data for Vietnam that suggests the country is significantly boosting defence spending this year, in large part because of concerns about China. One of the key concerns for countries like Vietnam are what appear to be China’s expansive claims to most of the South China Sea (with a little intimidation of Vietnamese fishing vessels thrown in for good measure). Still, despite the story making a splash around the world last summer as tensions in the region mounted, China appears to have done little to correct this misunderstanding—if indeed that is what it was. The consequence is some smaller neighbours believing they need to do a little muscle-flexing of their own. China has a long and impressive tradition of warcraft. Studying it properly would do the West a world of good. The West’s First War with ChinaThe Pentagon on ChinaVietnam Eyes Foreign HelpChina Military Spending Up 12.7%Has Xi Fully Consolidated His Power Over the Military?